20 x 30 area: 7-10 players on the outside, 2 start in the middle + 1 Defender. 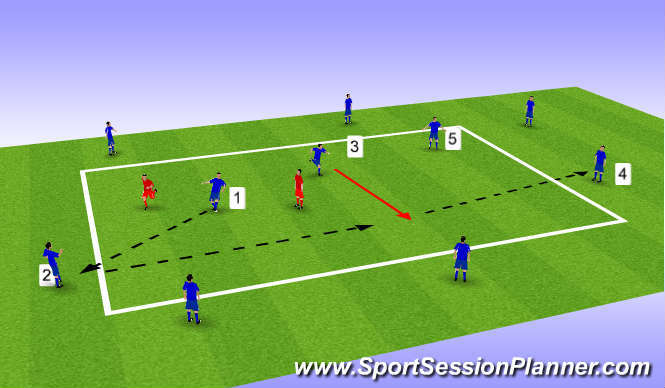 1-- Play starts with player 1, who makes a free pass to player 2 ( Defender in Red) without defender stopping the ball. 2-- On player 2 receiving the ball, play is live and player 2 has to play through the middle to player 3, who makes a run in behind the defender to receive the ball. 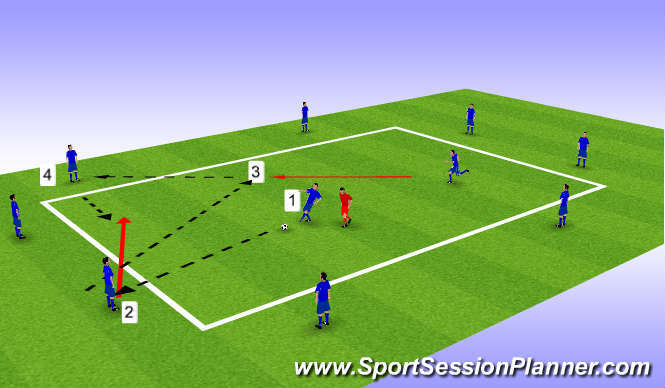 3-- Once player 3 receives the ball he plays to the outside (diagram shows player 4). 4-- Player 4 then has to play through player 2, who would be in the middle. Progression:20 x 30 area: 7-10 players on the outside, 3 start in the middle + 2 Defenders. 4-- Player 4 then has to play through player 2 or player 5, who would be in the middle.